So here's my Second Pictorial for the festive season, this one being more Indian as the previous one was kind of a Western Makeup Look. Btw, do let me know if you like the pictures. I recently got a tripod and I am really poor at posing. So, a feedback would be appreciated. 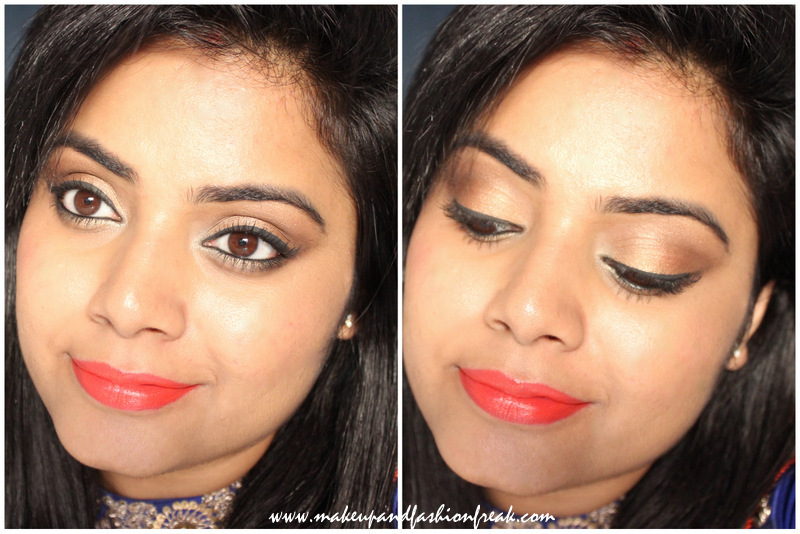 Coming back to the Makeup look, Keep reading to know more. I really wanted to do a pictorial for this look but I couldn't find time with so much going on for Diwali ~ Shopping, Cleaning etc. Anyways, it's an easy eye makeup and can be achieved easily. Also, the colors look more vibrant in person. So, here's what I used and step by step tutorial. 5) Lakme Absolute Shineline Liquid Eyeliner in Black. 1. Use an eyeshadow primer all over your eyelids. First, apply a light, matte brown e/s on the crease to give it a little definition, Now, take the pretty gold eyeshadow from the palette and gently pat it all over the eyelid till the crease. Also, blend it well. 2. Next, take the coppery brown eyeshadow and apply it on the crease and on the outer corner of the eyes, blending well. 3. Now take the third e/s and apply it on the browbone and on the inner corner of the eyes. 4. Tightline your eyes, Apply a liquid eye liner on the upper lash line. Also, apply mascara. 5. For the lower lashline, first apply kajal to the outer 1/3rd part. Take the coppery brown eyeshadow on a smudger and apply it over the kajal and smudge it well, blending any harsh lines. 6. Take the gold eyeshadow and apply it on the remaining 2/3rd part of the lower lash line and blend it well too. Finish off with applying some mascara on the lower lashes as well. And you are done. This is my complete look. Hope you all like it. Let me know if you have any queries.